It’s time to go fishing for wishes! Your son-in-law is the most special fish in the sea because he’s the one who got the opportunity to marry into your family! Let him know what a catch he is with this shimmering birthday card. His large and kind heart is one of the things that makes him special; make sure he knows that by giving him this large “happy birthday” wish! 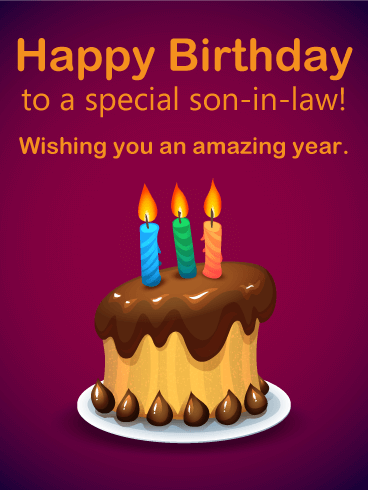 HAPPY BIRTHDAY, SON-IN-LAW!! You don’t need to go fishing for birthday wishes, because the biggest birthday wish is already on your line! Have a spectacular day, birthday man! 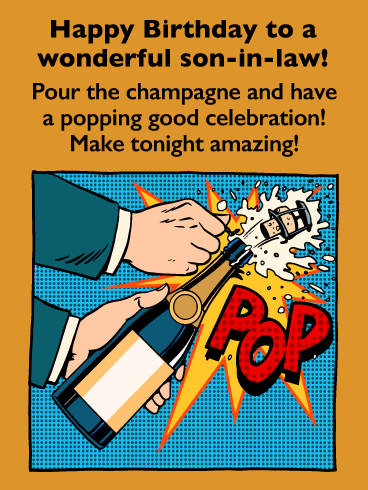 For the son-in-law that enjoys a sparkling celebration, give him the card that joins in! Birthdays are a grand cause for celebration, from gifts to cake to champagne, it’s all a cheer for another great year of life. Bless your son-in-law with wishes of good health and cheer. Send your love and make sure you give the card that pops! Break out the party hats and balloons! Light the candles and throw the confetti! Birthdays are fun occasions to celebrate the people who mean the most to us. 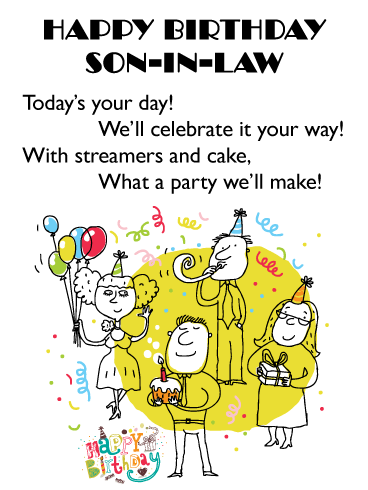 For the social son-in-law who loves to socialize, give him the card that says “This party is for you.” Make sure he knows he is loved and the center of attention on his birthday. Some things in the world are automatic classics, like the Model-T’s and antique pistols on this celebratory birthday card. 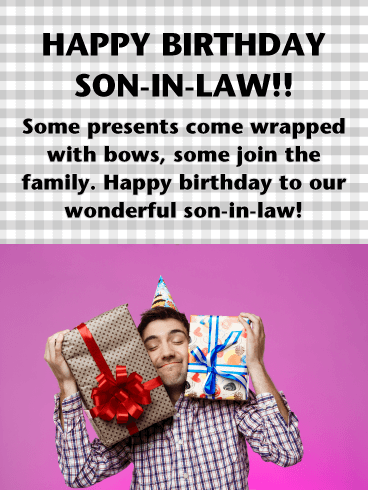 They never go out of style, and neither does your son-in-law! Let him know how perfect he is with this stylish birthday card. With elegant manners and a fierce mindset, you know your son-in-law is a righteous man. 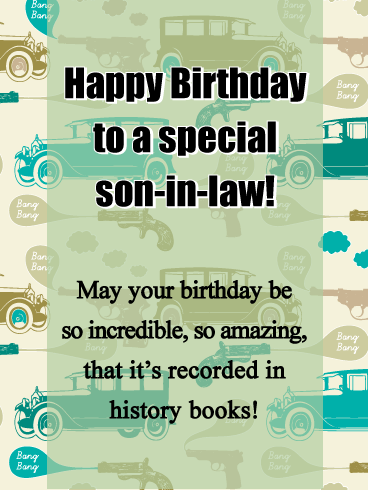 So let him know you’re proud to link your family history with his and send him this incredible birthday card! 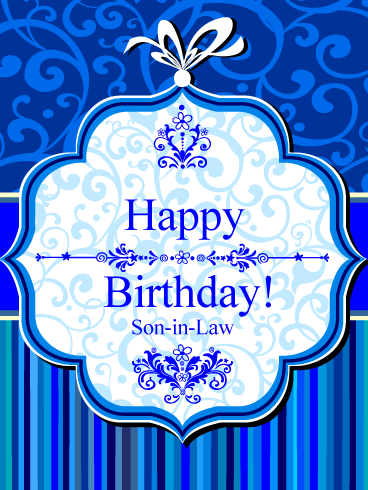 Wish a special son-in-law a very happy birthday with this simple yet thoughtful birthday card. A single, candle-topped cupcake and festive streamers set a festive tone to make him feel loved and remembered all day long. What to get for the son-in-law who has everything? A heartfelt birthday card expressing love and welcome! 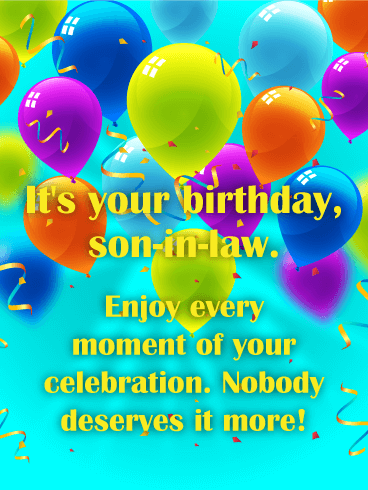 This card lets your son-in-law know you consider him part of the family now and you are happy to have him there. 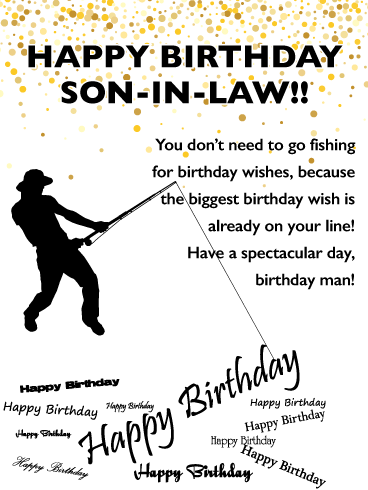 Sincere and forthright, this birthday card gets right to the point in telling your son-in-law that you wish the best for him. Birthdays are wonderful events to celebrate those you care about. With balloons and cake, everyone can have a great time. 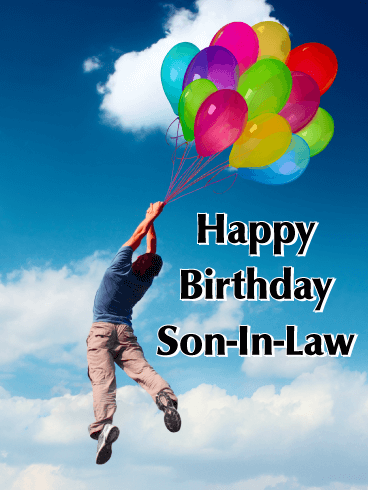 For the son-in-law a flight away, send your birthday wishes on a cloud of balloons! Encourage happiness with this card’s blue sky and colorful balloons and cause laughter that can carry you away to brighter days. This is the perfect card for a son-in-law who is out of this world, or just miles away. 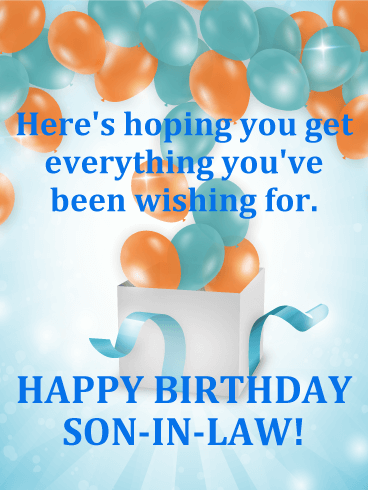 This colorful birthday balloon card is perfect for wishing your son-in-law well on his birthday. Flashy yet sentimental, it will remind this special member of the family to "enjoy every moment" of his celebration. After all, nobody deserves it more than he does! Everyone loves presents, especially on their birthday! Good things can come in small packages, and the most heartfelt gift can be the words in a simple message. So send the perfect card to your gift-loving son-in-law. 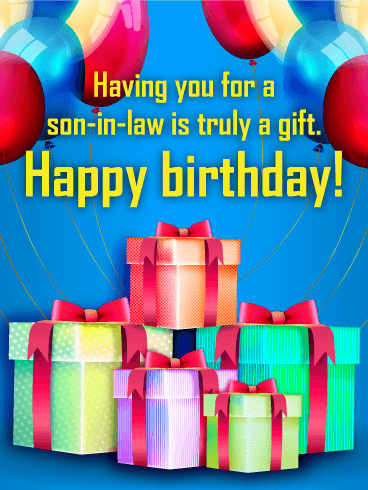 Let him know what a gift he is to you and your family with this amazing birthday card. It expresses all your love and appreciation. Perfect for winter birthdays, this simple, elegant card suggests the season with its clean lines and cool colors. Your son-in-law will love the neat cheeriness of the center design suggesting a holiday ornament. All wrapped up with a bow, this humble message says all that your son-in-law needs to you. That you recognize him, you think of him, and that he’s a valued member of your family. He may not have been born into your family, but he's become a very special part of it. 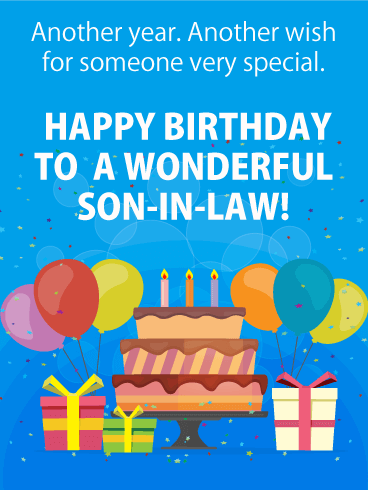 Let your son-in-law know how much he means to everyone by sending this card to celebrate his birthday. Featuring a present wrapped in handsome blue ribbon, it's a great way to remind him that he truly is a gift. Celebrating a very special son-in-law on his birthday! The bright white background and vivid balloons set just the right tone for a party, where he'll hopefully get everything he's been wishing for! 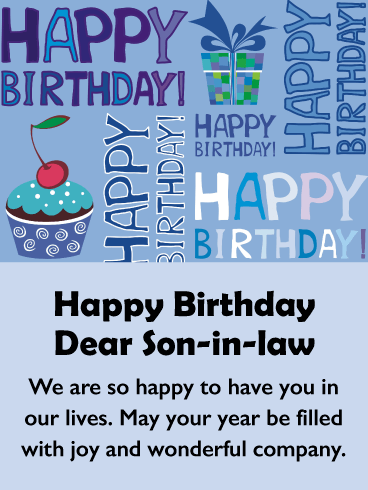 This birthday card brings your best wishes for a wonderful son-in-law. He's such a special part of the family, and the thoughtful words will remind him of that. A big, bright birthday cake adds a festive touch to this thoughtful greeting card.